Donkeys enjoy grooming sessions. These sessions are a good time not only to clean up but also to bond with your brayer. While grooming, you should also check his body, as well as his legs and hooves, for any cuts, scrapes or incipient skin issues. That way, you might take care of some minor problems before they become more serious. Grooming a donkey isn't the same as grooming a horse. Keeping a donkey truly clean is almost impossible. In summer, they love to roll in the dust. It helps keep parasites off them, but makes cleaning a true chore. Frequent bathing isn't an option. Many donkeys don't care for getting wet, but even those that do tolerate it shouldn't be bathed more than once or twice a year. Bathing removes protective oils from their coats. For basic grooming, you'll need a stiff brush. Brush in the direction the hair grows. This basic grooming tool gets rid of surface dirt and encrusted mud. Use a soft brush for his face and ears. Your donkey grows a thick coat in winter. This coat protects him from snow and sleet, so you must take care when grooming in cold weather. If you're familiar with horses, you know that their coats begin shedding heavily in early spring. Donkeys are different. They don't shed out as early, so your donkey might be quite hairy even when the horses display their spring coats. Let nature take its course. You can use a shedding blade on your donkey's coat, but don't use it until the it's warm in the spring. You shouldn't groom your donkey as much when it's cold. Air pockets in his coat provide insulation, so you don't want to inadvertently destroy them. 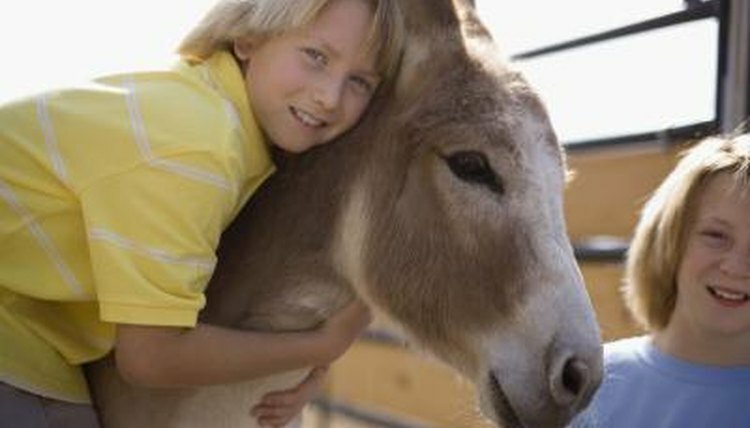 While taking care of your donkey's feet, be on the lookout for any infections which might make him sick and pay attention to the length of his hoofs. Your donkey requires regular hoof trimming, at intervals of four to eight weeks. You can have your farrier trim the hooves, or learn how to rasp them yourself. If you show your donkey, you need more extensive grooming. He must look his absolute best before the judges. If he's still got his winter coat before an early spring show, you'll need to clip him. However, that means he'll need a blanket to keep him warm if it's still chilly. Clip at least a week before the show so any unevenly shorn hair can grow out a bit. Before heading off to the show, put some hoof polish on his feet to make them shine.